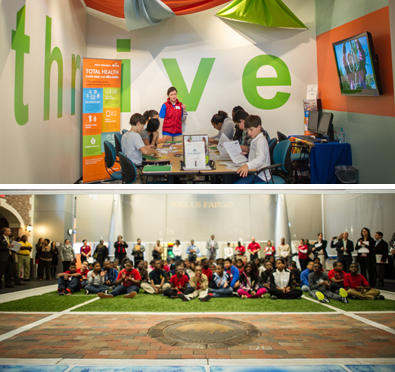 Junior Achievement's Chick-fil-A Foundation Discovery Center features two simulated environments: JA BizTown and JA Finance Park. In addition to the two Junior Achievement programs, the facility also includes a theater, a pre-function/reception area, meeting rooms, and offices. The JA BizTown program focuses on business-to-business commerce, where sixth-grade students attend work for the day. 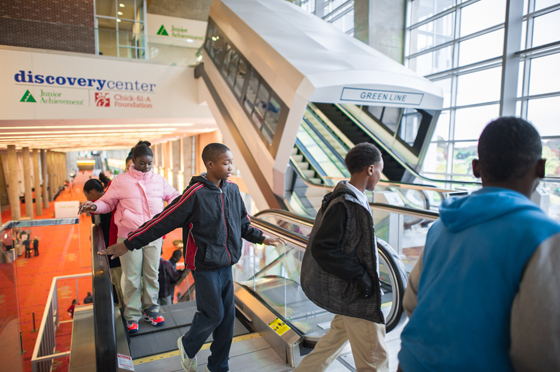 Upon arrival to the JA Discovery Center, the children ride the "Green Line" subway train to work at their assigned "store." Each sponsored store is led by a team of students that includes a CEO, a CFO, and support staff. Throughout the simulation, students learn how businesses operate on a daily basis, such as paying operating costs and working with other businesses within the city. Organized around the Mayor’s podium in a courtyard mimicking Centennial Olympic Park, JA BizTown embodies present-day Downtown Atlanta through the use of traditional materials and design. JA Finance Park is best described as a 3-D version of the board game "LIFE." Eighth-grade students are assigned a life scenario and progress through 18 steps of developing a budget and experiencing the responsibilities and challenges of adulthood. Inspired by the development and growth of Midtown Atlanta, JA Finance Park represents the “City of Tomorrow” and showcases modern materials and energetic spaces.